This recipe makes for a healthy low-carb salad for busy work days and tight schedules. It is a great addition to a filling meal to avoid a carb crash. You can also pack with low-carb tortilla or pita for your lunch break or have it on many of your weeknight dinners. It is just the right combination of healthy, salty, and tasty to brighten your lunches or dinners. It tastes great the next day so you can refrigerate it if you made a large bowl for a family dinner. This baby beet salad is a definite must try. The garlic gives this salad an amazing taste! 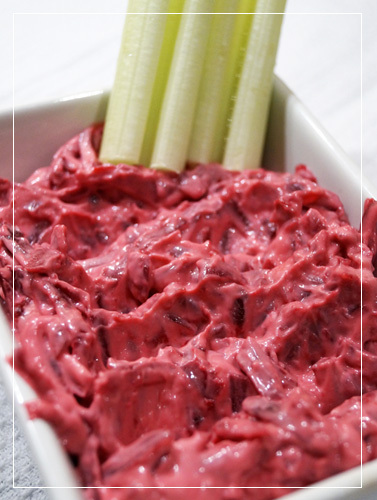 You can also use it as an appetizer or dip! Get a medium sized bowl and grate the baby beets in it. Add the mayo and mix well. Crush the garlic using garlic press (preferable) and mix well. Serve the salad with celery sticks. You can keep the salad refrigerated for up to 5 days. Alternatively you can cook your beets. Place the raw beets in a large pot, fill up with water and bring to a boil. Cook for 1 hour on medium heat. When beets are fully cooked, remove from the pot, peel and grate them.